Gorgeous puff heart silver bracelet with a wishbone t bar. A lovely Valentine's gift. 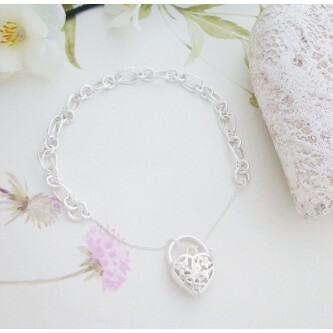 A gorgeous silver bracelet featuring a detailed filigree padlock heart. A very pretty, sparkly and feminine heart bracelet, all women will adore this gorgeous bracelet. Silver bracelets for women including tag bracelets in solid 925 sterling silver and elegant designs as well as the classic heart bracelets and charms. All of our bracelets are in 925 sterling silver and all are hallmarked. The Guilty silver bracelet collection comes with free delivery in the UK and Ireland, all bracelets are sent in padded bracelet boxes that are designed to protect your bracelet and keep it in perfect condition. A unique range of pretty ladies sterling silver bracelet’s hand-picked by Guilty Bangles for their unique designs, high quality craftsmanship and outstanding finish. At Guilty, we pride ourselves in providing a range of silver bracelets for women that we feel are stunning in design, made from the highest quality materials for the price and have meaning behind them. Hence, our range of pretty womens bracelets in 925 sterling silver have been chosen because we believe that they represent outstanding value for money given the quality of the materials, the intricate designs and the craft of the designer. The range is designed to provide a suitable piece for all types of shopping events, from a gift for a partner to choosing a designer piece for a special event such as a black tie ball, prom or wedding. We have created a range that is elegant, ideal to match an evening dress for a black tie ball for example that will add a touch of class. We also want to provide a range that is suitable for day wear, bracelets that are comfortable to wear all day long as well as for that special event!